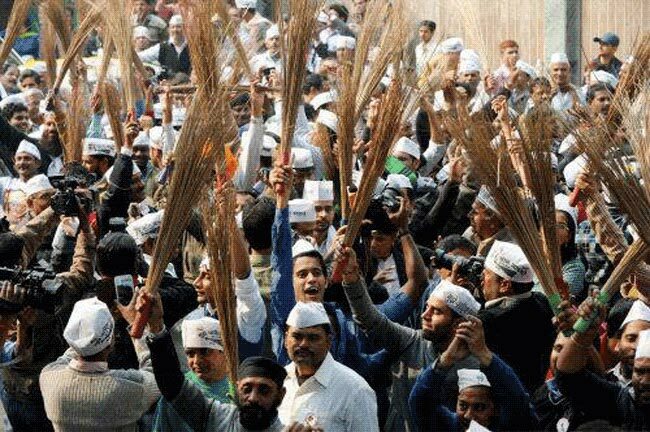 The Gujarat unit of the Aam Aadmi Party (AAP) launched a "broom march" as part of its campaign for the Lok Sabha elections and to expose corruption of the state government. "The march began from Indulal Yagnik's statue in Lal Darwaja area of the city and it will cover all Lok Sabha constituencies of the state," AAP media coordinator Harshil Nayak said. File: AAP workers on a broom yatra. Television journalist-turned-politician Ashutosh was in city to launch the march. "The broom march will cover all constituencies going to polls in the Lok Sabha elections. It will end on January 30 at Mahatma Mandir in Gandhinagar," Nayak said. "Gandhiji was shot on that very day (January 30), but today, AAP will expose how Gandhiji is killed in Gujarat everyday," he said. Meanwhile, Ashutosh also questioned the Gujarat model of development today. "Unless corruption is weeded out from Gujarat, the real progress of the state will not be known. The Gujarat model of development is just propaganda by Gujarat Chief Minister Narendra Modi," Ashutosh said. "This march is aimed at leveraging the membership of AAP. We are trying to connect to as many people as possible," AAP state convener Sukhdev Patel said. AAP has attracted 2.5 lakh people in the state so far as members and it has decided to contest all 26 Lok Sabha seats in the state.